I didn’t even realize my Mom was really into gardening until we moved into our place in the south bay. She planted all sorts of plants she used to crave in secret and told me of her grandpa’s tiny garden in their tiny courtyard at Shanghai. She sought out the kind of blossom and fragrance from her childhood: osmanthus, night blooming Jasmine, Wisteria, bougainvillea, gardenia, etc.. Luckily they all seem to thrive in Bay Area weather. Along the way she discovered and adopted plants she found in the bay area. She became an extremely proficient African Violet grower. Her favorite pass-time was to browsing the nursery at homedepot, and pick up leaves/twigs fell along side of the nursery isle. Came home, she would try to grow them into full plants by first place them into small jar of water, once enough roots grow out, she will move them to a pot of soil. I observed and grew very fond of Mom’s gardening philosophy. She dislikes bonsai and any kind of restrictive cultivation method. She prefer to let plants grow wild naturally and she would not force anything to grow in places that they are unhappy. She joked that that’s how she raised my sister and I as well. I feel so fortunate! When i moved to SF with ZM in 2004, Mom started dispatching plants she deemed suitable for our apartment to SF with us. Following her simple instructions, I found out that i was not exactly bad at gardening either. I applied Mom’s principle well. Only the ones suited my lazy habit got to live. Then came the orchids. My first attempt started shortly after we moved to our apartment on Cole st.. I was obsessed. Read everything i could find on-line, and tried to follow instructions no matter how strange it was. But it was not meant to be. One by one my orchids all died. 🙁 Mom thinks it is the light and air in our apartment that’s not suitable for orchids. Most of our living space faced west, the sun was too hot for most of the orchids i tried then. The only east facing window was in our kitchen, where the air circulation was not that great. But looking back, i suspect the main reason was my obsession. I was way too attentive. Orchid really thrive under mild negligent. Most orchid growers were intimidated by the perception of orchid’s fussiness, so they tend to err on paying too much attention to them. Most of orchids end up either drowned by too much watering, or stressed out by constantly changing location by their owners. After we moved in our current place 2 years ago, my orchid obsession came back. First, both Mom and i thought our central patio was the ideal place for orchid. Initially it seemed to be true. Every orchid we brought in the patio thrived. Encouraged, both Mom and i started enlarge our orchid collection. I soon ran out of places to put new orchids in the patio, they started invading my living room, which have two large South-East facing windows. After going through one full year of season changes, my orchids in the patio started to decline, but the ones in the living room continue to do well. And I also noticed that moth orchid does very well in my living room, but dancing doll and others don’t. Meanwhile, Mom has discovered the orchid stand in San Mateo farmer’s market on Tuesdays, where you could get gorgeous and large orchid for as low as $5! Her orchid collection exploded. But she noticed something else, exactly opposite to my house, eventually her moth orchid would start to wilt but her dancing dolls, spiders and every other kinds continued thriving. So we purged our collections and did some exchange. I end up with almost all the moth orchids, and she kept the rest. If negligent is the key to the heart of orchid growing, then i have been practicing exactly that during the past winter. I’ve left them unwatered for as long as 3 weeks. Came spring time, they all started to grow flower stems! Among my current orchid collections were three baby ones that Mom had picked up last Fall from a flower shop’s garbage can. They have been sitting on my living room side table since Mom cleaned them up and potted them. Two of them immediately started growing new leaves, one stayed weak but managed to survive. Around thanksgiving time, the two stronger “garbage” siblings started growing a flower stem each. I was amazed. Ever since my orchid fever started back in 2004, i’ve been reading admirably about the orchid expert who would pick up dried up orchid or discarded misshapen ones from the street and nurse them back to life, then anxiously waiting to discover what kind of flowers these orphaned darling would produce. I never thought I would get to do that one day too! As the morning sunlight became more abundant during the last month or so, one of the baby orchid’s flower buds grew rounder and fuller every day. I was full of anticipation. What color would it be? Will it be the most common white with yellow center or will it be a surprise?! This morning, I noticed the first petal opened a crack! Excited, i rushed over to take a look. Hmm… purple with strips…could be like this, which is rather common. Or maybe like Mom’s first orchid? It is not purple, but red! Stunning rich red with thick fuzzy stripes, and a velvety red center plus a white tip. White and purple are common moth orchid color. Haven’t see that many red. I’m elated. Have been googling all evening and eventually found it in one volume from Google Books: Moth Orchids: The Complete Guide to Phalaenopsis. 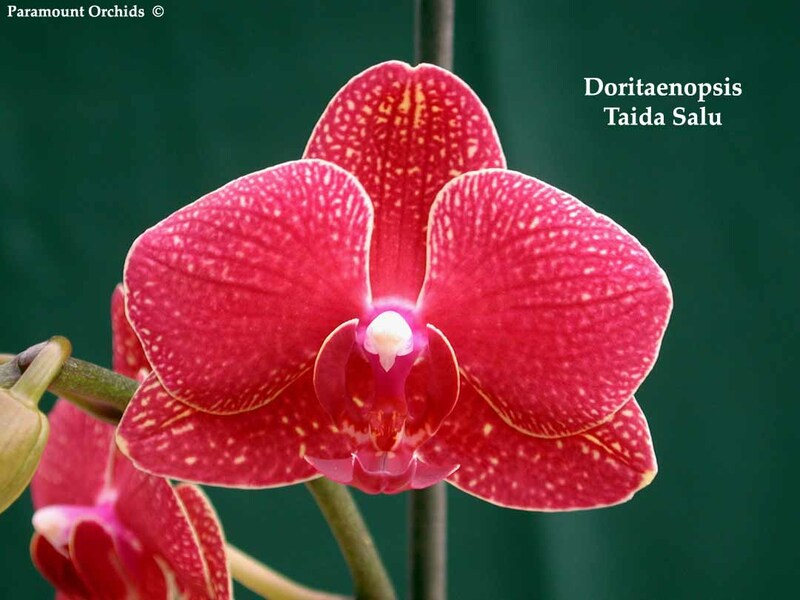 The orchid is called Doritaenopsis Taida Salu ‘Alisan’. Originally from China! It has been almost two years since Jennie recommended this little hole-in-the-wall Japanese restaurant in Daly City to us. We finally made it in on Friday for lunch and we loved it! I had chicken teriyaki and tempura combo. ZM had Unagi Donburi. He said it is the first Unagi Don he had in the bay area that actually cooked the Unagi in open fire. On my end, I’ve never seen chicken teriyaki cooked this way before. It was boiled with lots of ingredients, so it was like a stew but minus the soupy part. The meat was very well cooked that they fell out of the bones. Yum. I liked their tempura too. Next time maybe i will try their “Japanese Beef Hamburger” or teriyaki beef. We saw them on other customers’ plates, and they look yummy! Very reasonable priced, and huge portion! Gloomy Sunday morning, browsing web in bed using my SIM-less iPhone, kept on coming up with new ideas for the on-going renovation. As I am typing this, the promised rain has started, soft but insistant pattering on the skylights, like little feet.